Pebble House is probably the only house in central Whitstable offering that sort of accommodation: 3 bedrooms / 3 bathrooms - large kitchen/dining area - sizeable garden. And all of that literally a stone's throw from the beach, harbour and main street, in the very heart of the Conservation Area. The house sleeps 8 people, but will accommodate another 2 for big parties. It can accommodate 2 families comfortably. 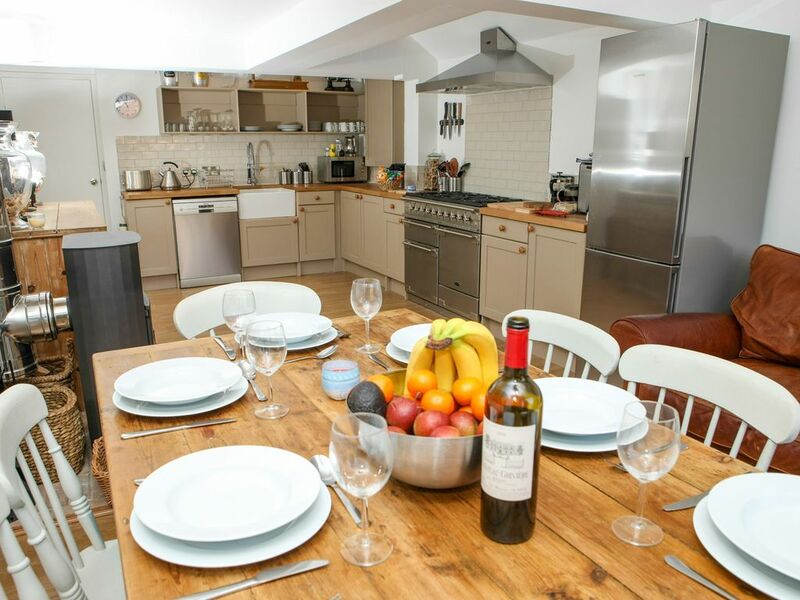 Newly renovated, it boasts a very high standard of equipment throughout: WIFI, log burner, cooker range, billiard, Nespresso machine, bread maker, flat screen, barbe q etc etc. It is furnished with an eye for detail and offers a casual luxury feel. No expense was spared during this long renovation project. We are proud to offer what we genuinely think is a fantastic value for money deal. The house is equipped with BT fibre unlimited broadband. Huge fans of fresh air! Quiet (no through road) and yet literally one minute from both the beach and the high street. The best of both worlds! Houses in this particular area also have larger gardens than average. Pebble House has been designed to accomodate large groups. This is probably the only house in the Conservation area with 3 beds/3 bathrooms. The large back extension + garden offer a great space to entertain, in all seasons. 1 family bathroom with bath/shower. 2 ensuite with shower. Lounge area with flat screen/sound system. Sofa + chairs. Massive kitchen / dining area. Very high standard of equipment (range cooker, Nespresso...). Large table/billiard for 8 people. Sliding doors opening on large garden. Woodburner. There are 2 golf courses within a ten minute drive - one of which is in Whitstable itself. Outside: Large private garden. Equipped with outside dining set (up to 10) and barbe Q. Pebble / decking area. Cleaning / Towels / Linen / Maid service: Quality linen & towels are provided. Other: The ground floor bathroom works well for children (all age). Well-located, beautifully finished house - great for a weekend by the sea! We rented this property for a weekend away with the girls. The house is lovely, very clean, high quality finish and lots of cool interior design touches. There's a great kitchen/diner space that leads onto a large garden which is perfect for entertaining, and the house is a stones throw from the high street and beach. Had everything we needed for a lovely break! Very well equipped house suiting an extended family well. The very large number of toys was very much appreciated by 1 very happy 2 year old! If anyone has any mobility problems then the steep stairs will be awkward and headroom is an issue in the loft conversion room. We had a great stay here for two nights for a girls weekend. Loved the open plan kitchen which is where we spent most of our time. Went for a walk into town and the seafront the next day which was very close. Overall a perfect weekend away, and looking forward to a visit in the summer! Well equipped, child friendly, clean. Had all we needed for a pleasant holiday. Good position. Lovely holiday cottage for family. My grandson loved the toys and videos. Well equipped. Three good bathrooms. Could do with a stair gate for top of first flight of stairs. We had a happy stay in Whitstable. Lots of room despite exterior looking small. Very comfortable. Sitting room could do with being bigger. Would certainly come back here. Whitstable is a destination for windsurfers and kite surfers alike and there is also a lively sailing scene with sailing clubs in Whitstable and nearby Tankerton. Fantastic walking is to be had along the coastline(The Saxon Shore) and there is woodland nearby you can walk to Canterbury(called the Crab and Winkle Way 7 miles) without barely having to cross a road. The house is 200 yards from the harbour, the beach and the harbour. Only 1h30min from London (road/train). 30 minutes from Eurotunnel terminal. Walking distance from train station. Directions: Take the Whitstable exit from the A299. Follow signs for Whitstable. Drive down Borstal Hill, through traffic lights and under a railway bridge. Continue through the high street until you approach the harbour. Turn right in Woodlawn Street and right again in St Peter's Road and then straight on - Victoria street is the 3rd street. Airport ~ London Gatwick - 66miles ; Airport - London Heathrow - 76 miles; Channel Tunnel - 29.8miles ; Train Station - Whitstable - 0.6miles; Ferry Port - Dover/Calais -31miles ; Ferry Port - Ramsgate/Oostende - 21miles; Motorway M2 - 9miles ; Motorway M20 - 28miles. Whitstable is famous for its long association with locally caught seafood and in particular oysters, it has one of very few remaining working harbours with a small fleet of fishing boats, that catch fish daily for sale in the harbour fish market. Many of the towns very good restaurants serve excellent fish dishes, but also cater for meat fans and vegetarians. The countryside nearby is great for walking and cycling with very little to interrupt you between Whitstable and Canterbury except woodland. Changeover during high season = Saturday. On changeover days, check-in is from 4pm and check-out is by 10am. However, this can usually be extended if there are no other guests leaving/arriving the same day. Cautionary deposit of £150. Please email for further details.